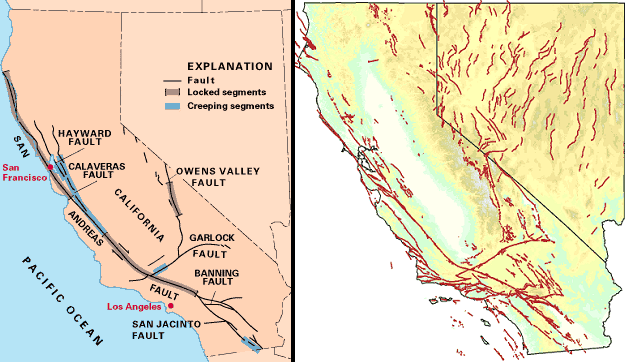 On a map of the whole state, the great earthquake faults of California look like a pretty simple set of lines that join and divide in a loose tangle: the San Andreas Fault Zone. But what exactly happens where a fault splits in two? If you cut the map along those lines into wedges and slivers of the Earth's crust, then try to move them past each other, you can't make them fit exactly right. How does the Earth do it, and what does that mean for earthquake ruptures in these areas? Geologists have spent the last century mapping the state's faults and measuring the tectonic ground motions that put stress on them. During that century, they've also monitored earthquakes of all sizes (most of them too small to feel) to see precisely where the action is happening on those faults. Only in the last couple of decades have they begun to look at faults in three dimensions. It's a brain-busting exercise in 3D visualization, using several techniques to provide clues. Our own Hayward fault was an early subject. 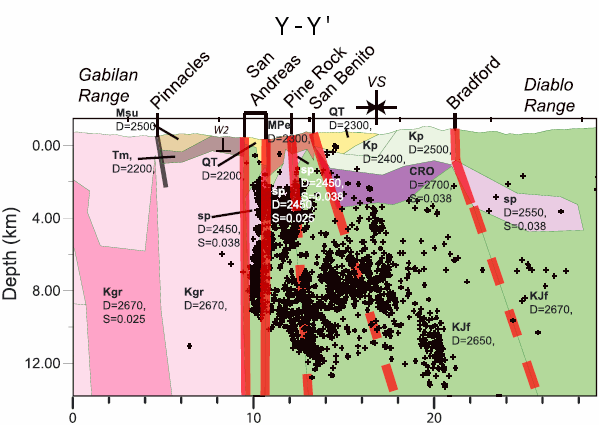 A new paper in the journal Tectonics (open access) has begun to lay bare the intricate buried structure south of Hollister where two major faults come together, the San Andreas and Calaveras faults. The work of peeking downward into the crust is slow and labor-intensive, but it's our only way to check whether our maps are misleading us. It starts by tracing surface rocks downward into the ground, using gravity data and magnetic data to match patterns deep in the crust to confirm that rock units of the right density and magnetic characteristics exist where they're expected. At the same time, the locations of thousands of tiny earthquakes show where faults are in motion today. Each of these forms of datagravity, magnetics and seismicityis fuzzy in its own way, making certainty almost impossible. However, it helps that we have precise data for the Earth's surfacewhere the rocks and faults lie and how tectonic forces are moving the landscape. In the Tectonics paper, Janet Watt and four of her colleagues at the U.S. Geological Survey office in Menlo Park assembled their evidence for the CalaverasSan Andreas junction, in the Coast Range mountains around Pinnacles National Park. Here's what the faults look like on the map, close up. I'm not showing the rocks because it would be too confusing for anyone but a geologist to enjoy. Putting together all of the data that I described, the authors built a detailed picturea model, in scientific-speakof the region. Here are the three cross-sections of that model. They're what the model looks like if you sliced it apart along the three lines X-X', Y-Y' and Z-Z'. 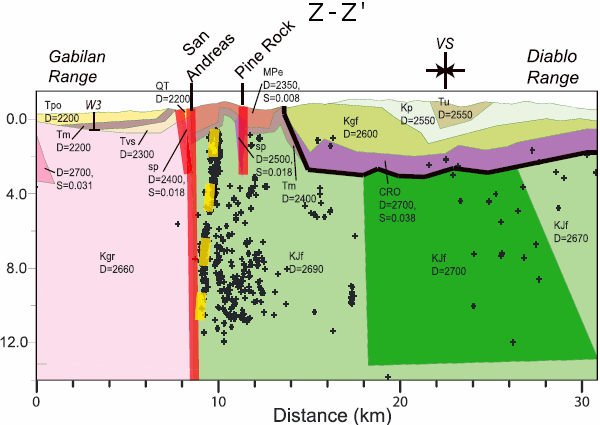 Cross sections from Figure 6 of the Tectonics paper. Granite of the Gabilan Range on the left (west), mostly older rocks of the Franciscan complex on the right (east). Black dots are earthquake locations, red lines are active faults (dashed if possibly active). The model is quite an achievement. The authors singled out two noteworthy features, shown by the yellow dashed lines. 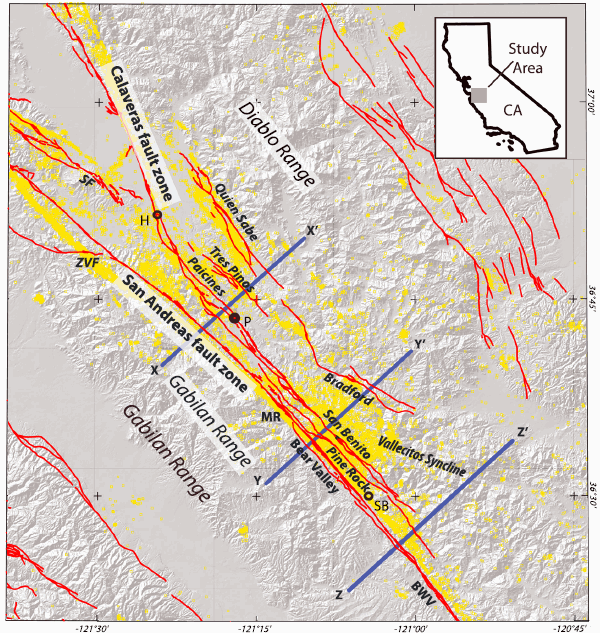 These appear to be deeply hidden active faults that connect the San Andreas and Calaveras faults, transmitting motion between them. Over geologic time, these "cross faults" are very temporary things, but right now they're important links in the chain of energy that causes our earthquakes. Because earthquakes can spread from one major fault to another, these are the things we need to find if we want to learn our earthquake future. 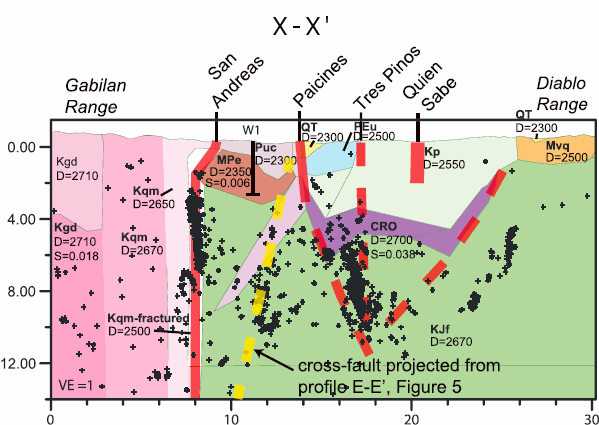 Another thing the authors point out is the key role of the rock serpentinite, which appears in the model as a usual suspect along these newly traced cross faults. 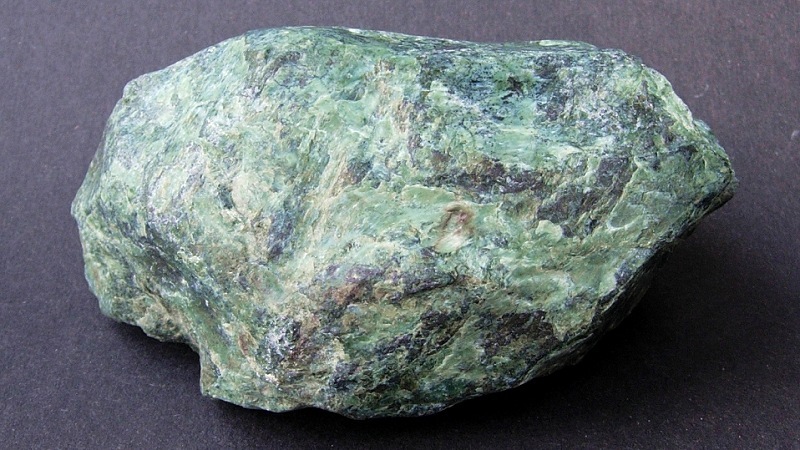 Little did our legislators know how important "serpentine" is when they named it America's first official state rock, back in 1965.